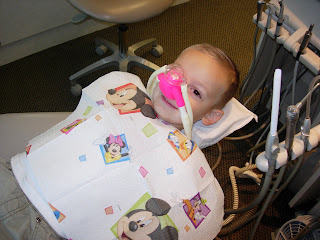 Eighty Porter Toes: Carson, "Brave at the dentist"
Carson so bravely and excitedly went to uncle Marks office to get 2 fillings. He was excited about the "Pig" nose and smelling the bubble gum scent, I tried to talk them into giving me some too! Not a chance!! Uncle Mark, hard at work. It was all worth it!!! He got his prize, wasn't that the whole point in going, anyways? 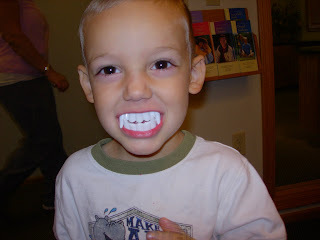 too bad he didn't get the teeth before Halloween! 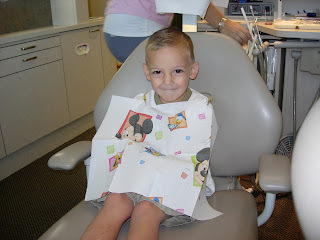 He is brave, I hate going to the dentist! What a great idea for a prize! 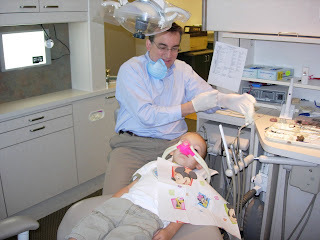 I will have to tell Dr R. about that!